Health care development is sometimes classified as vertical or horizontal. Vertical programmes target specific diseases or disease clusters. For example tuberculosis, HIV and malaria, are targeted by the Global Fund. Horizontal programmes, by contrast, seek to strengthen the system within which health care is embedded. Such programmes are concerned with human resources, financing, education, and supply chains, among many other functions. There has been a strong push to move from vertical to horizontal programmes from many corners, including from this News Blog. Supporters of such a change in emphasis cannot but acknowledge the massive successes that vertical programmes have notched up, especially in the fields of infant health, maternal health, and infectious diseases. However, the limitations of a purely diseased-based approach have become increasingly evident. Logically, it is not even possible to instigate a vertical approach in a complete system vacuum. For example, it would be difficult, if not impossible, to instigate a programme to improve HIV care, if the supply chain could not make drugs available and if the health system could not support basic diagnostic services. That said, vertical surfaces should not be able to siphon off more than their fair share of the health services infrastructure. A recent Lancet paper on health services in Ethiopia made a further important point, that vertical systems can make a very good platform to extend and deepen generic health systems. In fact, that is precisely what has happened in that country, with full support from the Global Fund and GAVI, the Vaccine Alliance. They refer to this combination of vertical and generic development as a “diagonal” investment approach. We would prefer to describe the relationship as one of symbiosis in which vertical and horizontal programmes are designed to reinforce each other. The Ethiopian initiative involved strengthening the system at multiple levels, from health service financing, human resources policies, education, investment in primary care, and community outreach activities, along with support for community action and self-help (including the “IKEA model” previously described in this news blog). Certainly, Ethiopia, along with other countries such as Bangladesh, Thailand and Rwanda, stand out for having achieved remarkable improvements over many dimensions of health. In Ethiopia the reduction in mortality for children under the age of five years was 67% from the 1990 baseline, while there was a 71% decline in the maternal mortality ratio and deaths from malaria, tuberculosis and HIV were halved. This took place against a financial backdrop of declining international aid but increasing domestic expenditure. The combination of vertical programmes and health system strengthening seems to have ensured that the money was not wasted. Assefa Y, Tesfaye D, Van Damme W, Hill PS. Effectiveness and sustainability of a diagonal investment approach to strengthen the primary health-care system in Ethiopia. Lancet. 2018; 392: 1473-81. Lilford RJ. Pre-payment Systems for Access to Healthcare. NIHR CLAHRC West Midlands News Blog. 18 May 2018. Nodding Syndrome: Autoimmune Reaction to the Parasitic Worms That Cause River Blindness? We have described the above enigmatic disorder of young children in East Africa before; a degenerative brain disease characterised by repetitive nodding movement, an inability to swallow, and eventually global brain failure. Authors of a recent study hypothesised that the disease may be caused by an autoimmune response to the river blindness parasite. They detected auto-antibodies to the parasite more often in cases than age-matched controls from the same village. The antibody attacks various cell markers in the mouse brain among neural networks that are affected in nodding syndrome. But only about half the patients with nodding syndrome exhibited the antibodies. The authors speculate that a number of yet to be identified antibodies may also be involved. I wonder why the disease does not map onto the geography of river blindness, which appears to be much broader than that of nodding syndrome. So, here is my hypothesis. Remember, a few News Blogs ago, I articulated a ‘three hits hypothesis’ as the cause of many diseases. One example was cytomegalovirus infection, which in the presence of the malaria parasite, and along with genetic predisposition, leads to Burkitt’s lymphoma. So I suspect that exposure to river blindness may be a sensitising event, and propose a search for a further exposure that is more specific to the ‘nodding syndrome belt’ extending from South Sudan, through Uganda to North Tanzania (see Figure). 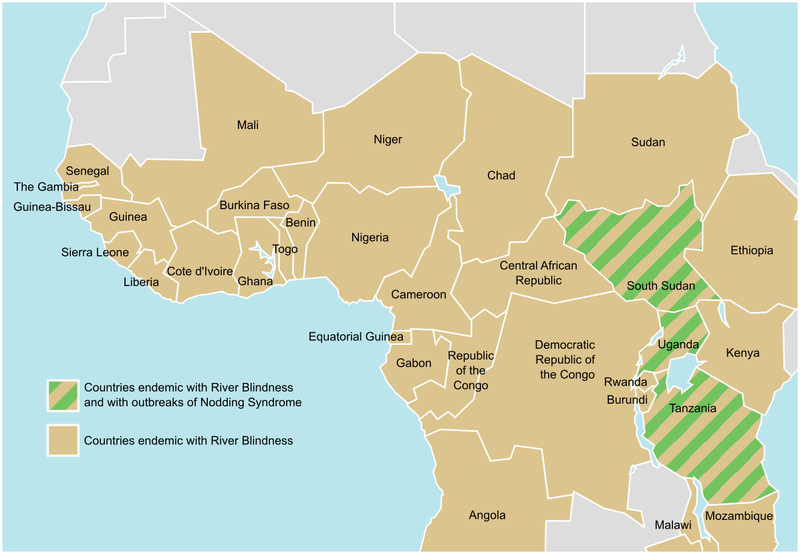 Data on River Blindness taken from the World Health Organization. Chilton PJ. A Mysterious Disease with Unknown Cause. NIHR CLAHRC West Midlands News Blog. 27 June 2014. Johnson TP, Tyagi R, Lee PR, et al. Nodding syndrome may be an autoimmune reaction to the parasitic worm Onchocerca volvulus. Sci Transl Med. 2017; 9. Genetically predisposed person –> Exposure 1 –> Exposure 2 –> Disease. An intriguing example of a three-hit condition is the severe disease of children – Burkitt’s lymphoma. This cancer arises in germinal centres of lymph nodes in the neck. It is known that Epstein-Barr (EB) virus infection is necessary for endemic Burkitt’s lymphoma to develop because it prevents apoptosis (cell death) when certain mutations occur in the cell. But endemic Burkitt’s lymphoma only occurs in the malaria belt, and why this is so has been a mystery until the last few years. Now we know that the malaria parasite Plasmodium falciparum ‘upregulates’ an enzyme that causes mutations in DNA in lymph cells. These mutations are a normal part of antibody production since rearrangements of chromosome segments is necessary for antibody specificity. But in people with falciparum malaria, the effect ‘spills over’ to cause mutations of cancer genes. The double hit of EB plus malaria sets the scene for carcinogenesis. Why in the neck – perhaps because lymph cells in the necks of children work particularly hard eradicating throat and ear infections, in which case there is a ‘four hits’ hypothesis! Thorley-Lawson D, Deitsch KW, Duca KA, Torgbor C. The Link between Plasmodium falciparum Malaria and Endemic Burkitt’s Lymphoma—New Insight into a 50-Year-Old Enigma. PLoS Pathog. 2016; 12(1): e1005331. CLAHRC Africa is planning a study with Anja Terlouw and Linda Mipando of the Malawi, Liverpool Wellcome Trust Centre, to reduce the prevalence of malaria in villages in Africa. Artemisinin therapy for clinical cases is the single most cost-effective measure for malaria control, while treatment of pregnant women can also bring an important health gain. Major works to drain swamps and remove standing water are beyond scope. So we are considering community-based interventions. One problem with bed nets is that anopheline mosquitos are developing resistance to the insecticide. Other approaches include regular indoor residual spraying so that surfaces are coated in a substance lethal to mosquitoes, but this requires fastidious application of the insecticide and is expensive. Yet another approach is mass treatment of whole populations, as discussed in a recent edition of Science. However, this risks promoting resistant strains on a large scale, so a modification of the mass treatment approach, based on screening and treatment, has been advocated. However, that may be ruinously expensive. Of course, there are approaches aimed at reducing breeding grounds for the vector, which are certainly effective if they can be implemented. Diagnosing and treating pregnant women is an important strategy. Malaria vaccines are starting to look promising, while we wait for widespread application and evaluation of existential approaches, such as introducing sterile males into the unsuspecting anopheline population. In the meantime, our plan is to select the most propitious community-based method and roll it out in collaboration with authorities, as part of a cluster RCT, perhaps using a step-wedge design. Morel CM, Lauer JA, Evans DB. Cost effectiveness analysis of strategies to combat malaria in developing countries. BMJ. 2005; 331: 1299. Roberts L. Rubber workers on the front lines. Science. 2016; 352(6284): 404-5. Keiser J, Singer BH, Utzinger J. Reducing the burden of malaria in different eco-epidemiological settings with environmental management: a systematic review. Lancet Infect Dis. 2005; 5: 695-708. Hill J, Hoyt J, van Eijk AM, et al. Factors affecting the delivery, access, and use of interventions to prevent malaria in pregnancy in sub-Saharan Africa: a systematic review and meta-analysis. PLoS Med. 2013; 10(7): e1001488. Garner P, Gelband H, Graves P, et al. Systematic Reviews in Malaria: Global Policies Need Global Reviews. Infect Dis Clin N Am. 2009; 23: 387-404.